Evolution rather than revolution, X2 is a worthy upgrade for X1 users and a great PC DAW option for everyone else. Automation lanes at last! Console Emulator sounds fantastic. Auto Zoom is most helpful. That Smart Tool keeps getting smarter. Breverb and TH2 are winners. R-Mix is less than effective. Screen feels cluttered at times. A new version of any serious DAW is typically packed with new elements and functionality to delight the ear and eye, while enhancing workflow and sometimes ditching ageing assets and legacy features. "Sonar X2 comes with less emphasis on flashy toys, and more on changes and enhancements"
Sonar X2 (previously Sonar X1) - available in Essential (£89), Studio (£195) and Producer versions, the last being the 'full' version, and the one we're looking at here - is no exception, though perhaps it comes with less emphasis on flashy, high-impact toys and gadgets, and more on changes and enhancements to the day-to-day stuff that users actually have to deal with most. If this sounds like a bit of a let-down to those hoping for piles of new synths and effects, it should be understood that Sonar is now a very mature DAW that has for some time included everything you might need to produce professional quality tracks on a PC. If the (very) vocal user base is to be believed, there's always room for improvement to existing features and that's exactly what the developers have done here, applying nips, tucks and tweaks that many Sonar users have been asking for, while adding a number of familiar tools that are already successfully in place in competitive products. There are literally hundreds of changes on Cakewalk's list, so we'll use our limited space here to focus on the most significant of them - there's an awful lot to cover, so hold on tight, cos we've got a lot to get through! "The methods by which you interact with the Sonar interface have been radically adjusted and enhanced"
At first glance, the Sonar interface seems virtually unchanged. However, the methods by which you interact with it have been radically adjusted and enhanced - even down to the way you perform the essential functions of pointing, clicking, selecting and dragging. The Smart Tool introduced in X1 has been given a brain boost, now interacting even more closely and logically with the various functions in X2. For example, right-clicking and dragging now selects as a lasso tool, while left-clicking and dragging will select a range of, say, clips or notes. Also, it's no longer necessary to click outside a clip and drag over it to select it - a welcome change, and certainly a more familiar process to those who might be coming to Sonar from another DAW. Another change comes in the way you zoom in and out of both your project and your clips. First, there's the newfangled Auto Track Zoom, a function that forces all tracks to be viewed at the same zoom height as the selected track when activated. Thankfully, the Timeline zoom has also been given a much-needed overhaul. Now, when you zoom using the Timeline, the zoom stays focused on your point of contact, no matter how far you zoom in or out. This might seem like a minor change, but we found that it sped editing up significantly. Automation lanes have come to Sonar at long last, and are beautifully realised. Automation envelopes can still be overlaid on top of clips if you want, but now you can access each automated parameter in its own lane. Combined with the Smart Tool functions, editing automation envelopes is now a breeze - even a little inspiring. Take and automation lanes are available and customisable. Sonar will automatically assign a default parameter to each new lane you open, but this can of course be changed with ease. As we've suggested, X2 is not entirely lacking in out-and-out gee-whizzery - far from it, in fact. This time around, guitarists get the benefit of a cutdown edition of Overloud's TH2 plugin - there's a wicked selection of virtual cabinets, amps and mics that sound utterly convincing. "The icing on the cake is the inclusion of the stunning Console Emulator"
Sonar X2 Producer users also get an array of effects built into TH2, as well as the gorgeous Overloud Breverb, a world-class reverb available as both a ProChannel plugin and a VST one (you can't use it in other VST hosts, alas). The icing on the cake, though, is the inclusion of the stunning Console Emulator in the Producer edition's ProChannel (Sonar's superb in-built channel strip system), enabling users to avail themselves of the sound of three classic consoles. Offering an experience akin to Slate Digital's VCC or Sonimus' Satson, the Console Emulator smooths over any harsh digitalisms and gives your mix a subtle yet pleasing warmth and girth. Having this built right into the DAW is a real workflow-enhancer too. Sonar X2 is a logical continuation and refinement of X1. It almost feels as if Cakewalk meant to bring these things to its DAW all along, but didn't want to spring them on users all at once. The improvements to the interface are certainly welcome, even if they do take some getting used to at first. We found little to complain about, though we felt the interface to be a little overloaded for a single screen - but then you can rearrange it as you like and assign screensets, so that's no show-stopper. Speaking of show stoppers, we're happy to report that X2 is far more stable than earlier versions. The potential sound quality is awesome. The Console Emulator, Breverb and Overloud effects are all stellar and very powerful enticements to upgrade from X1. 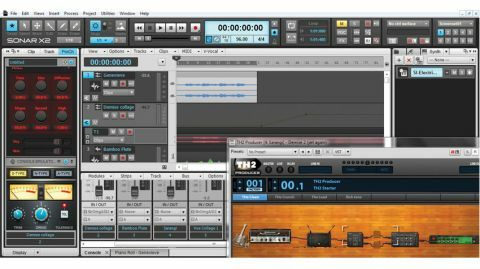 Will X2 convince users to jump ship from competing DAWs? Probably not, but for anyone wanting to get serious about recording and production on a Windows PC, there are very few options that come as fully loaded as Cakewalk's amazing DAW.